REDMOND, Wash. (CNNMoney.com) -- Microsoft Chief Executive Steve Ballmer said Thursday that the software giant is urgently working with its partners to unveil a host of tablet computers running Windows 7, to compete with Apple's fast-selling iPad. At a meeting with financial analysts on Thursday, Ballmer outlined the company's strategy to catch up to Apple and Google in the consumer space. He said Apple is doing an "interesting" job with the iPad and has "sold certainly more than I'd like them to sell." As a result, Ballmer said his company's "job one urgency" is bringing Windows-based tablet computers to the market. "No one is sleeping at the switch here," Ballmer said. "We have got to make things happen with Windows 7 on slates. We're in the process of doing that as we speak. As focused as we are on this, our partners are also focused on this to deliver systems and chips to make this happen." But Ballmer declined to give an exact timeline, saying only that the tablets will be ready "as soon as they're ready" and "it ain't a long time from now." The CEO claimed that Microsoft needs to take its time to get its products just right to compete in the intensely scrutinized tablet space. He said that chipmaker Intel (INTC, Fortune 500) will be coming out next year with a tablet-specific processor called "Oak Trail" that will help manufacturers make better tablets that run Windows 7. Ballmer famously canned a turmoil-fraught Microsoft tablet project that had been in the works for almost a decade before the iPad came to market. With the early success of Apple's (AAPL, Fortune 500) iPad, many analysts are predicting that the tablet space will be one of the fastest-growing tech segments this decade, alongside smartphones. That makes Microsoft's urgency all the more palpable. 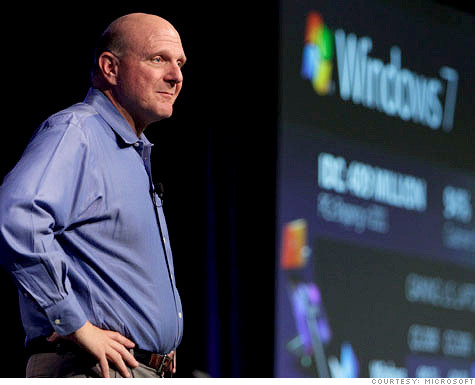 Ever confident, Ballmer exclaimed, "We're gonna sell like crazy!" Still, after the CEO outlined Microsoft's tablet plans, an analyst told Ballmer that it appeared that Microsoft had "no clear strategy." Ballmer disagreed, saying Microsoft's tablets will run Windows 7, they'll run Intel processors, they'll be available in a wide array of shapes and sizes across many manufacturers, and they'll likely be cheaper than the iPad. "Microsoft will have to pull a rabbit out of a hat to compete with Apple," said Al Hilwa, applications development software program director at IDC. "Apple has a less-is-more strategy to broaden its consumer approach with the iPad. Microsoft is committed to running Windows 7 on tablets, which is a concern." Microsoft's CEO focused his entire presentation on the company's consumer businesses, which are almost all trailing their competitors. Bing continues to lose money. "I can't say there's a point on the horizon where the business results will flip," Ballmer admitted. After demonstrating Windows Phone 7, which is set to go on sale in the fall, Ballmer said the company still had a lot of work to do to compete with Apple and Google. Microsoft intends to throw enormous marketing muscle behind the new smartphone operating system, riding the success of its "I'm a PC" campaign with an "I'm a phone too!" campaign. Xbox is the exception. It's a consumer product that is finally making money for Microsoft, Ballmer said. The controllerless Kinect accessory will be closely watched when it goes on sale for the holiday season, targeting the Xbox's 42 million users. Other top Microsoft (MSFT, Fortune 500) executives mapped out the company's plans for maintaining its leadership in the corporate market, which makes up three quarters of Microsoft's business. Microsoft's lack of success in the consumer world tends to overshadow how well it is doing in the enterprise space. It also doesn't help that Microsoft's primary strategy is relatively unexciting for the majority of non-geeks: The company aims to leverage its broad array of business products, massive data centers and experience in services to take a leadership position in cloud computing. Still, Microsoft is confident that its success in the future will depend heavily on how well it carries out its cloud strategy with businesses. Chief Operating Officer Kevin Turner said the company's cloud offerings will help fuel physical product sales and noted that 70% of Windows cloud customers are new customers. Turner lashed out at Microsoft's competitors like Google (GOOG, Fortune 500), Salesforce.com (CRM), Amazon.com (AMZN, Fortune 500), and VMWare for only offering only partial cloud services and solutions that he described as less than adequate for business customers. The harshest criticism was reserved for Google's Web Apps, which compete with Microsoft Office. Turner said Office's Web Apps are far more powerful than Google's, calling to attention to small things like Google's lack of a ruler function on its Docs app -- "things that we put in market almost 13, 14 years ago." He also shared several customers' complaints about Google's services and said a handful of companies that left Microsoft for Google are now coming back. Unlike its competitors, Microsoft can offer companies a full set of cloud-based services, including managed data centers and business software tools in one package, Turner said. Microsoft's cash cows also have room to grow. Windows 7 is selling faster than any other Windows version in history, but the vast majority of the company's customers are still using older versions of Microsoft software. Eighty-four percent of Windows users are running XP and Vista, 52% are using Internet Explorer versions 6 and 7, and 63% are using Microsoft Office 2003 and earlier. Now that businesses are beginning to refresh their hardware again, Microsoft believes there will be a tremendous upgrade opportunity to Windows 7 and Office 2010.